I had no idea how much beauty in my surroundings could inspire greatness in my life until I started collecting Italian Art Deco furniture. But then, with understated elegance, creative design and the unsurpassed quality of Italian masters, how can the beauty of Italian Art Deco furniture not inspire someone to greatness in their life? Italian Art Deco is part of the larger art deco movement of the last century. It tends to be more refined and less opulent than the better known French furnishings from this period. World War II interrupted this trend in Italy and accounts for a smaller production of these styles. As with most mid-century furniture, interest has been on the rise in this millennium. 1. The Italian designers’ inspiration, passion and creativity in furniture design can inspire you in your own pursuits. I find myself taking a deep breath as I admire the simple, yet elegant detail of the leg of my Osvaldo Borsani dining chair, flowing gently down to the floor, and turn my thoughts to imagining what I’ll create next in my business or home life. 2. 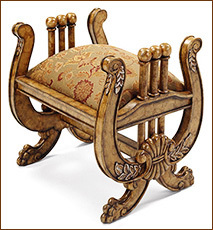 Beautiful furniture in your home can help balance or center you much like being out in nature. Nature themes are quite common, as was the use of burled walnut, rosewood and other exotic wood in Italian design of this period. 3. Finding beautiful Italian Art Deco furniture is a self-discovery process that will inspire you to see your own beauty, the beauty in others, as well as remind you of the beauty in the world. I am continually touched by the beauty of these objects in a way that resonates with my soul. Italian Art Deco furniture is accessible to anyone with Internet access thanks to online auction houses and the rising interest in mid-century design. I started collecting one piece at a time, as my budget would allow. I would only buy something if I really loved it and saw beauty in every detail. 1. Subscribe to Modernism Magazine (www.modernismmagazine.com) and other mid-century publications to educate yourself on this design style. 2. Go to www.wrightauction.com and view past or upcoming 20th Century Italian Design auctions from Chicago-based Wright Auctions. Another auction house is Rago Arts in Lambertville, New Jersey (www.ragoarts.com). 3. Educate yourself on this period. Go to www.amazon.com and search mid-century furniture, a specific designer’s name, Italian furniture, etc. to familiarize yourself with this period. Although there are books available on Gio Ponti and other designers, many will be in Italian, including books available at Amazon.com. 4. Attend Modernism shows. Upcoming show events across the United States are listed in Modernism magazine (www.modernismmagazine.com) or contact a local art deco society for information. Speaking with dealers who share an affinity for Italian Art Deco is the best way to start educating yourself on this topic. 5. Contact dealers (primarily in large cities such as Los Angeles, Miami, Chicago and New York) through Google searches. Search their websites and don’t hesitate to ask for more information, including additional pictures, certificates of authenticity and furniture condition. In some cases you can buy on approval and just pay shipping if the item isn’t satisfactory. 6. Register at the online decorative arts source, www.1stdibs.com. This site has professional dealers from all over the world and you can narrow the search to those dealers in your geographic area. This site screens dealers and has a wide assortment of inventory. If you value quality, elegant detail and design that honors nature’s materials, you’ll fall in love with Italian Art Deco furniture. I will never tire of the beauty and richness of my collection, and the financial investment will grow over time. Best of all, these lifelong friends will inspire me to breath, to create and to grow. Joanne Goldman is the Founder and President of Creative Insight Consulting, a coaching, training and business consulting company. She supports successful businesses and professionals in the further achievement of their goals.